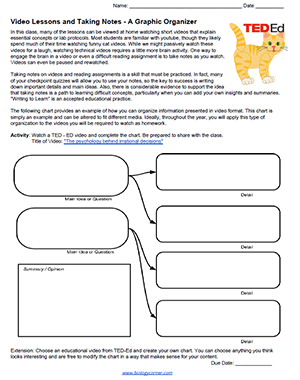 This lesson introduces students to the idea of watching videos at home, taking notes, and then coming to class with understanding and knowledge to apply to a classroom activity, like a lab or discussion. Students watch a 4.5 minute TED Ed video: “The psychology behind irrational decisions” and complete a chart on the main ideas and details. This can be done in class so the instructor can model how to fill out the chart. Students are then asked to find a video that interests them and create their own graphic organizer. It does not need to be exactly like the one they did in class, and in fact, probably won’t be the same. Graphic organizers should have as many boxes and links as needed to provide an overview of what was learned. This lesson was designed to help my students with the “flipped” portion of my classroom, where they watch and learn at home and come to class ready to apply that knowledge. Many teachers are saving time by using a “flipped classroom” model of instruction. In this model, students watch instructional videos at home and spend their class time practicing skills, doing labs, or discussing what they have learned. This model doesn’t work for everyone. A major challenge I encountered was that students wouldn’t take the time to watch the videos and would come to class expecting me to reteach it or to go over it. While I don’t do the “flipped” model for my whole class, I do enough lessons like this to develop strategies to ensure students are doing their homework. Have students take notes and bring them to class. I check them when they enter (usually with just a stamp) and then they can reference their own notes during the class activity. Post videos on Edpuzzle where questions are embedded in the video. This can even be linked to Google classroom for automated grading.